Being a citizen of India, you must be aware of the importance of the Voter ID card issued by the Election Commission of India. The Voter ID serves as an identity proof for the citizens. Any citizen with a voter ID card is eligible to vote for municipal, state as well as national elections. Apart from voting eligibility, the Voter ID is used as an authentic identity document and is used for several purposes. What if the Voter ID card gets damaged or is lost? What If you don't have a copy of the voter ID card? If you apply for a new Voter ID card, it will take time to issue a new Electoral Photo ID Card. Instead, you can print voter information and use it for several purposes. Though you can't download Voter ID Card Online, you can print the voter information which serves as the substitute for the voter ID card. Step 1: Visit the official website of the Chief Electoral Officer/National Voters Services Portal http://electoralsearch.in. On the homepage of the site, you will see two options, i.e. Search by Details and Search by EPIC Number. Select one of the two options. Important Note: If you select 'Search by EPIC No. option, it will be easier for you to get the Voter ID Card details and if you select 'Search by Details' option, you have to enter the list of credential as required. Step 2: If you select 'Search by Details' option, you have to enter your Name, Age/DOB, Father’s/Husband’s Name, Gender, State, District, and Assembly Constituency. Now you need to enter the Captcha/Code as shown in the image and click on 'Search' button. 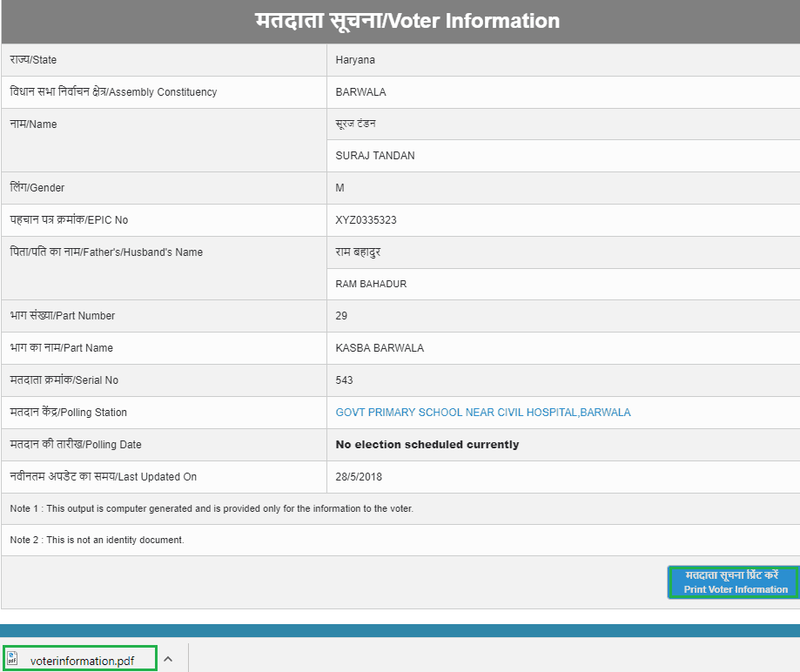 Just click on View details, the screen will display the Voter ID card details which you can print and use for several purposes. Step 3: If you go with 'Search by EPIC No.' option, you need to enter the EPIC No. and select the State as applicable, in the provided boxes. The next step is to enter the Code as shown in the image and click on 'Search' button. Step 4: Next you need to click on view details to go ahead. Step 5: The screen will display the Voter ID card details. Click on the Print voter information to download the file in PDF format. How to download duplicate voter id card online.